So if you read the previous post, you may now have started to understand deck-building as a whole. You’re starting to get that it’s not just about adding any and all cards to your deck willy-nilly, but picking and choosing the ones that actually get your deck closer to accomplishing its goal. You know that getting rid of useless cards can be a more effective turn than keeping them. But still, it’s hard to put these concepts into practice, without… well, a little practice. Each deck-building game is a little different, but this is a Dominion strategy guide. So let’s dive in to Dominion. Did you hear me? Never. I know it’s tempting. Look at it; it’s free. What else are you going to do with that extra buy with no treasure left? I’ll tell you what you’re going to do. You’re going to not buy copper, that’s what. While it may seem like a good idea to add more treasure to your deck, copper just drags your hand-treasure average down, making it harder to reach the target hand of eight treasure. As you gain experience, you will probably figure out that there are times when it is okay to buy copper. (Cards that do the most when you have the fattest deck possible, for example.) But for now, you’re learning to become a master, so you’re not going to buy any copper. Ever. Got it? You know what’s great? Treasure. Not counting copper. You can’t always count on bonus actions, but you can always count on playing every treasure in your hand. If you keep getting frustrated when you play that Smithy and you draw three action cards, the problem isn’t your bad luck. It’s that you’re not buying enough treasure. Even while some tempting action cards have treasure bonuses on them, you still run the risk of drawing them when you can’t play them (or having to choose between them and other useful actions). Buy lots of treasure. Almost without exception, the first time you have six treasure in hand, buy a gold. It’s also important to remember that no matter how many wonderful action bonuses there are and how many +4 cards and +1 buys you can play, if you don’t have the treasure to back it up, this doesn’t matter. I’ve seen people go through ten action cards, end up with fifteen cards in their hand, and only have a spending power of five. Because they didn’t buy treasure and therefore couldn’t draw it from their deck. It has nothing to do with luck. 2. Attacking is not all that it’s cracked up to be. Seriously folks. I know, I know, those attack cards are very tempting. And you know what? They can be devastating when used correctly. They will hinder your opponents at the key moment or weaken their deck to slow them down overall or stuff their hands full of garbage. The trouble for you comes when you focus too much on the attacks. Not as good as you might immediately think. Not useless, but use with caution. 3. The best way to defend against attacks is to build a good deck. Okay, so you’re avoiding attack cards, but your opponent picks up that Militia or the Witch. You panic, and in response buy up all the moats. Guess what? You just did it wrong. Exaggerated for clarity, but the set on the right is vastly superior to any number of moats. I know that moats are tempting—they only cost 2 and they protect against attacks! Plus, you get +2 cards! Unfortunately for you, there’s a reason why the card only costs 2—because it’s not all that it’s cracked up to be. It doesn’t improve your deck all that much, and it depends entirely on luck whether you have it to protect you when someone else plays an attack. So what do you do against those deadly, ferocious attack cards? If you’re doing a good job building a good deck, the answer is probably “nothing different.” You’re a lot more likely to have a few expendable cards in your hand than you are to draw your Moat when the Militia is played. If “trashing” cards are available, you should already have them in your deck to get rid of the other sucky cards (namely copper). The fact is, if you have a well-built deck, an opponent’s attack cards won’t hurt you as much as they think. 4. Pay attention to cards that trash. You remember Key Point #1 from the previous post? It’s always good to remove cards from your deck. While there’s the obvious Chapel, which is a superb card by the way, there are a boatload of other ways to trash cards, and perhaps in ways you never thought of. Some are good early on (Chapel, Mine), and others can be extremely powerful late in the game (if you’ve ever used Remodel to turn a gold into a province, you know. And if you haven’t… now you know). Many cards allow you to trash a card and replace it with something better. “Trashy” in Dominion isn’t a bad thing. But don’t get distracted… the Feast only trashes itself. Some cards may seem less useful immediately—for example, the Upgrade, which trashes a card and lets you get one at exactly 1 cost greater. Well, you don’t always want to “upgrade” the cards you have, but did you realize that you can “upgrade” a copper into… you guessed it… nothing? We’ve already established that not having copper is better than having copper (unless you don’t have any other treasure… see point 1…). Most cards that allow trashing for a replacement force you to take nothing if there is no card matching that cost. In the case of copper and curses, that is good, good, good. Just be careful, because many cards REQUIRE you to trash something if you play it, and you may not always want to. 5. Are your victory cards really useless during the game? Not always. Well, the thing about these cards is, they usually offer an excellent bonus, or a significantly cheaper version of something else, in exchange for the forced discarding. You know what makes great fodder for discarding? Victory cards! It can often be risky to buy victory point cards too early, because they don’t do anything for you, or slow down your deck. But inevitably these will be added to your deck, and cards that require discarding are a great way to put those victory cards to use. Now it’s okay to have them because they are giving you points and you can now use them as discards. It may not be as clean as not having victory cards, but it certainly does help you accomplish the end goal. Pay attention to discards. This is what the Cellar is for. This and copper. There are other better cards that force discarding in later expansions. 6. Pay attention to what the other player(s) is/are doing. While Dominion may seem like it is to each player his own, a “multiplayer solitaire” of sorts, it really is kind of important to pay attention to what the other players are doing. Certain action cards grow quite powerful if you have a lot of them in your deck, so you may need to buy up some of those just to keep the other player from getting all of them. Certain attack cards are really only useful if the other player has certain cards in their deck, so if they don’t have those cards, there’s no use buying that attack (yet). 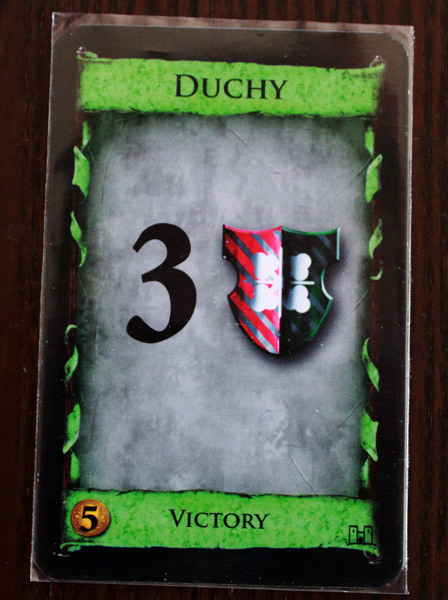 And paying attention to what victory cards they buy can help you make your own VP purchase decisions. For example… if they trash all their estates and you don’t, you can tie on provinces and you win. On the other hand, if you trash your estates and they don’t, you’ll have to make up for that difference at some point. And whether the other player has two duchies or three can make the difference between a win and a loss. All right, feelin’ good? Ready to take on some more opponents? Great. Excellent. Go out there and try putting this stuff into practice. Next time, I’ll go into specific elements of cards, and what they do for you. I think I often have an innate feeling that trashing/discarding is a bad thing in games, but I definitely agree with trashing being a big help in Dominion. Understanding the concept of thinning your Dominion deck really helped me step up my game. Great series of articles. Keep up the good work! I don’t consider myself an expert Dominion player. Obviously I could have played last night’s game better. 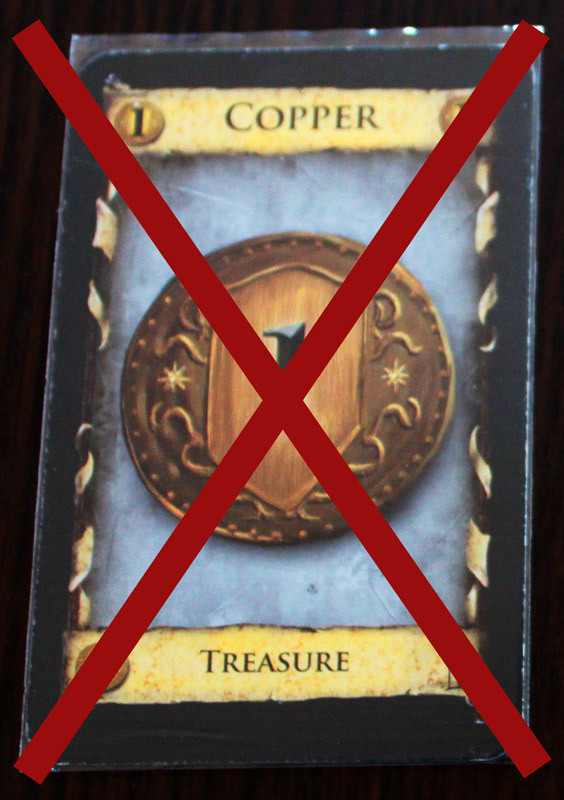 But I contend that the results of this game kind of poke some holes in the notion that one should “never ever ever buy copper” when playing Dominion. That being said, I’m open to constructive criticism here. Hey Timothy, thanks for sharing your numbers. It’s hard to say exactly what went wrong for you, because a lot about the order of cards you purchase and play matters a great deal. I see you have a wide variety of cards in your deck – Council Room, Throne Room, Moat, Thief. Often, it’s better to stick with one or two of those. Also, Moats are usually not that great – the +2 cards doesn’t give you much of a boost, and your opponent has no attack cards to even defend against in his deck. that being said, there are always setups that break the normal rules, and this is one of them. I generally encourage new players not to buy copper and to get rid of it if they can because this is one of the most difficult concepts to grasp and one of the most universally useful tools in your deck-building arsenal. Even when copper-buying strategies exist, it’s not easy to pull them off. This kingdom setup has two cards that change the game – Gardens, and Cellar. Since Gardens give you lots of points for having lots of cards, cheap coppers are a great way to pad your deck. This is especially true when you get lots of buys. Cellars also provide sort of an anti-fat-deck power. To build an efficient deck, you want to have a lot of good cards that you draw into your hand; getting rid of coppers gets rid of the bad cards that you would otherwise draw, leaving only good ones left. Cellars allow you to bypass the bad cards simply by discarding them for an equal replacement of draws. So it’s almost the same thing as not having them in your deck, and it works really well when you want to hit up those gardens. Your opponent in this case did a clever job of focusing on Markets, Villages, and Cellars so that he could boost his deck economy even while adding coppers and estates to power his gardens. Gardens are cheap, so that can work really well. I wasn’t there so I didn’t see the game play out, obviously, but I’m guessing you loved playing those Council Rooms? I assume you throne roomed a Council Room at least once or twice? That can be nice, but giving your opponent extra draws only powered up his cellars by letting them discard more cards at once, allowing him to further maximize his deck efficiency. It’s always better to play 1 Cellar discarding 5 cards than 2 cellars discarding 2 cards each. With all his cellars he probably went through most of his deck every turn, bypassing the victory cards, hitting his markets for the extra coin and buys, and landing 6-8 treasure without breaking a sweat. 1) It helps to show the entire game when asking for constructive criticism, as just the final deck lacks too much information. The dominion app (whether you’ve played it on your desktop or on your mobile) offers a permalink to game logs. After a game, you have an button which opens a game log, and you can get a web link to it. Shows everything from the kingdom cards, to all the turns/draws/buys etc. 2) Your deck contains 8 out of the 10 kingdom cards… Usually a sign of a bad deck. You need to decide what is going to be the way in which you get to the end of the game with more Victory Points than your opponents, and which cards you’ll need to do it in the fastest, most efficient way, and stick with those. (Doesn’t matter if you want to slow him down or make yourself faster, as long as you have a good chance of being faster than him). Spending more turns to buy more different cards gives you a lot less synergy in your deck, and a lot less of the cards that would be best for your strategy. His deck contains only 4 different kingdom cards, which at least shows he had some direction (though many of his cards seem strange together, it’s really hard to be 100% conclusive without a full game log. 3) Did you have a strategy here? Were you going to get enough treasures to buy provinces eventually (called a “Big money” strategy)? If so, you have way too many action cards that slowed you down from getting treasures. Were you trying to build a deck that gets to a point where it can reliably draw enough cards every turn to buy enough victory points to win (called an “engine” strategy)? If so, how was it supposed to work? Because the deck you’ve built has way too many cards that can land in your hand at the start of a turn, making it a “dead” hand as far as draws are concerned. What about the “moat” card? He has no attacks in his deck. I won’t touch on the specific attacks here too much, because attacks are somewhat more complicated of an issue – for example – “Thief” is considered to be one of the worst cards in the game, while “Witch” is considered one of the best cards in the game (and almost always an amazing starting buy). But these take a while to get the hang of. 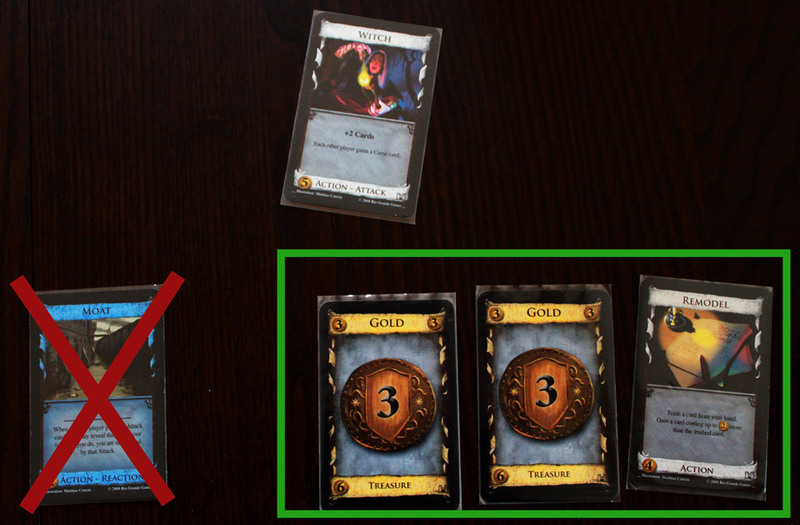 4) As an example of a “Big money” strategy with the cards I’ve seen from your game – “Big money + Council room” – buy silver and golds and 1 council room (a second one when the deck gets thicker). 1 early cellar is possible as well. Province when you can. Normally, by the time he gets his 5 markets and 3 villages you are already buying provinces. Just an example. Not knowing the rest of the kingdom cards, it’s hard to tell if there are even better bog money ideas… but that is the easiest and a very good one from the cards shown. Gardens usually need other cards to enable them as good options… But that will make this post way too long. 1) Have an idea of your strategy and which cards will help you the most with it. Stick with them if possible. 2) Use game log links when asking about games 🙂 It helps both you and the ones answering. Witch is a super super card. Often all you need is one chapel and one witch, and only money from there on out to best your non-expert game group!! !